In various way differentiate . We work according to a four-step system. A diligent and meticulous analysis of the client's problem/project, animates the development process, which then leads on to a comprehensive and effective solution. Leased lines also offer far higher speeds than 8Mbps. They can be bought at speeds of 10Mbps, 100Mbps, 1000Mbps or even 10,000Mbps. ADSL simply can't compete with that. ADSL is usually a 'contended service'. In other words, the bandwidth from your local exchange to your ISP is promised to 20+ customers. As long as few customers use their connections at once, this over-selling can go unnoticed. Unfortunately, at peak times when many customers are surfing the web, this lack of backhaul capacity causes your Internet connection to slow down. Leased lines, in contrast, are dedicated to you. If you have a 10Mbps connection, there's dedicated bandwidth from you to your ISP. There's no need for you to fight other customers to get a share of that 10Mb of backhaul. Many people think they have a 4Mbps connection or a 6Mbps connection. However that's just the download speed. The upstream speed is usually pathetic. On average it's just 800kbps. If all you're doing is surfing the web, this doesn't matter. However businesses often find this limited amount of upstream bandwidth to be inadequate to meet their needs. This is particularly true if they want to use online backup, transfer files via FTP, or let staff connect to their work PCs from home using Remote-Desktop-Protocol. Leased lines are symmetric, so they offer a much faster upload speed than most ADSL connections. ADSL runs over a standard copper phone line. After leaving your office, your phone line ends up in a bundle of other phone lines that are going to the same telephone exchange. Unfortunately the transmissions in these other phone lines can induce currents in your one, causing transmission errors on your ADSL connection. Leased lines are usually more reliable. For one thing, they often use fibre-optic cable, which doesn't suffer from this type of electrical interference. Secondly, they come with higher-grade more-expensive hardware, which tends to be more reliable. ADSL is far cheaper than a leased line. Unfortunately, that means that ADSL providers have far less money to provide support than do leased line providers. If you have a problem with your ADSL connection, you will need to spot it before troubleshooting will begin. Leased line providers will, in contrast, monitor your leased lines, so that they're aware of problems almost as soon as they happen. Leased lines come with Service Level Agreements (SLAs) and Service Level Guarantees (SLGs). ADSL connections don't usually come with these. Leased line problems are usually fixed quicker than ADSL ones. For example, one UK telecoms supplier offers a 5 hour fix target on particular leased lines. That's 24×7. So if you were to report a problem at 2am, they'll expect to have fixed it by 7am. ADSL connections seldom come with that. If you have a problem at 2am, you'll probably get a message telling you that their office hours are 9am to 5pm. When you call at 9am you'll be put in a queue. When you finally speak to someone at 9am they'll log a ticket. If you need an engineer visit to fix the problem, it could take days. And all the while, you'd be without connectivity. Leased lines cost a lot more than ADSL connections, but for that extra money you get a dedicated, reliable connection with good support, SLAs and a faster upload speed. You're paying for quality. Benefits of leased line over a broadband connection have encouraged a lot of businesses to consider such a service. In the past few years, immense development has been seen in the industry where it is easy to get a business internet connection of different types. In fact without a stable and efficient connection over the internet, survival in any business is extremely difficult. It is on such a service that almost every company relies on these days. Access to the service should be constant with a high speed internet connection as only then it will prove to be beneficial. What are the benefits of leased line over a broadband connection? If yours is a large business enterprise then the internet leased line is the perfect choice. Two places are linked with a fibre optic cable in this service thus allowing a channel for effective communication. This high speed internet connection is considered safe and reliable besides which the cable offers services on the internet. At the desired premises fitting of a router is done separately for accessing the internet. Connectivity offered is excellent besides which it makes the service even more profitable and productive which is one of the benefits of leased line over a broadband connection. As compared to the broadband connection in standard from this service is dedicated to one user which proves to be beneficial. There is no need for sharing bandwidth with other users. Since other users do not access this business internet connection, security of data is maintained. 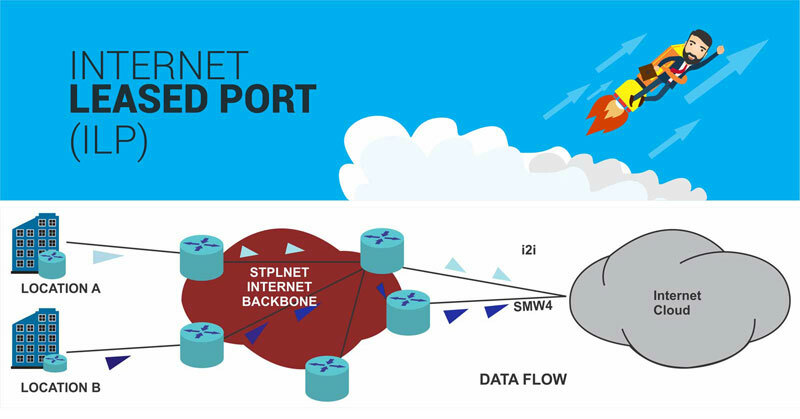 This is an internet connection available at high speed, is active at all times and allows incessant and even internet service which is one of the benefits of leased line over a broadband connection. You may wonder for which type of business, an internet leased line proves to be beneficial or not. Actually, it is the larger business enterprises that can enjoy maximum advantage of this service. For the medium and smaller business enterprises, this may not prove to be a feasible option. In India the leased lines have been gaining popularity gradually. Standard internet connections are now being replaced. In almost every metro city it is easy to avail, leased line services. Before considering a connection for a leased line a suggestion to conduct extensive research needs to be followed. Try to ensure that the provider for leased line service is genuine, reliable and affordable so that benefits of leased line over a broadband connection can be reaped. There is huge competition amongst providers of leased line services and hence finding a reputed and reliable one is not at all difficult. Ensure that the provider offers 24x7 customer support and care as well. Talking to a few people who are already using particular leased lines is beneficial. You will at least get an idea of the benefits of leased line over a broadband connection and which of the leased lines are being popularly used in the market.